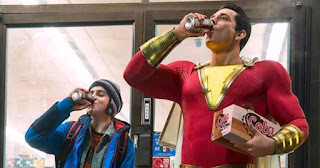 Welp, it's not exactly record-breaking but with 2 weeks left until Avengers: Endgame there's plenty of time for Shazam! to become a bona-fide success. If were being honest it's a fairly unknown character with a out-there story from a studio that doesn't currently have the best track record even if that record is steadily improving. That being said I thoroughly enjoyed just about every second of screen time this flick gave us so I hope it gets what it deserves. It didn't take #1 but a $25M debut from this second adaptation of Stephen King's morbid resurecction story is a nice start. Nice enough at least that we can plan on continuing to see these remade adaptations for some years to go. Even if it didn't, It: Chapter 2 is still left to premier this year which will definitely solidify the King universe. I'm somewhat surprised that Carol Danvers origin story isn't sitting somewhere closer to $500M given the excitement for this months big Marvel finale, everything else aside you'd think everyone going into Endgame would want to know about the Avengers new ace in the hole. Not that this take is anything to be sad about with the movie recently breaking $1B globally. This is somewhat odd timing for a movie like this. The true story of a former KKK leader and a civil rights activist. With the star power of Sam Rockwell and Taraji P Henson you would really expect this to hit between November and February when people seem more apt to take in a serious movie. Though, judging from Julian's review linked above it doesn't sound like there were many Oscar hopes here.